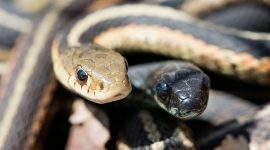 Common garter snakes, one melanistic, emerge from their hibernaculum in the early Spring. Click image to view larger. 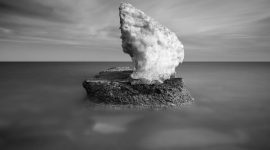 A mini glacier melts atop a groyne by the Centre Island pier. Click image to view larger. 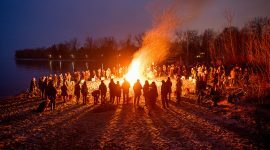 Ringing in Spring in style down on the beach. Thanks again Alice! A bitter wind blows snow across the Ward’s traffic circle as the sun sets over the Rapids Queen. Click image to view larger. 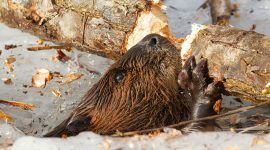 A beaver chews apart a heavy branch from a hole kept open in the lagoon ice. Click image to view larger. When an eagle lands in a tree next to you, you darn well know it. 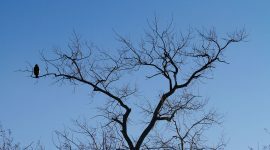 Here a female bald eagle perches in a tree off of the RCYC. Click image to view larger. 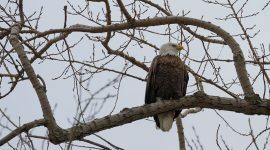 A male bale eagle perches above Kathleen and Ali’s house at the corner of Channel and Third. 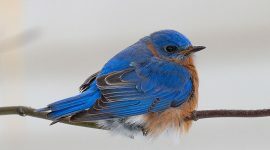 A bluebird lights up Channel Ave. on a cold January day. Thanks to David for the tip. 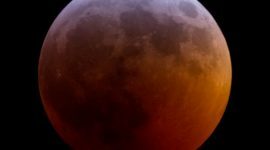 The moon approaches totality over the wet meadow during the full lunar eclipse of January 2019. 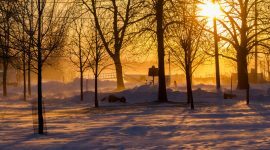 The -35°C wind chill was an added bonus. 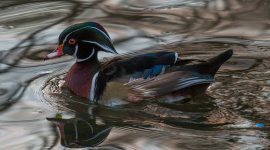 The unlikely colours of a wood duck on a warm January day. Derrick barge T.H.C. 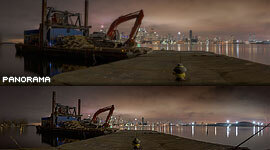 50 has completed her work removing the crumbling portion of the eastern gap. 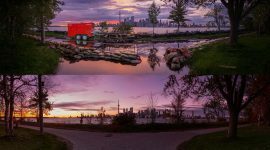 This panorama was shot on her last night moored just off of the cove. Click image to view larger. 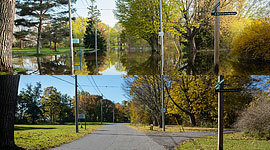 Seneca Ave after sunset during the Flood of 2017 and again in 2018. Click image to view larger. 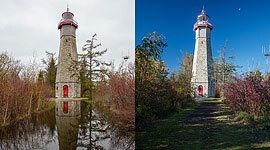 The Gibraltar Point light during the Flood of 2017 and again in 2018. Click image to view larger. 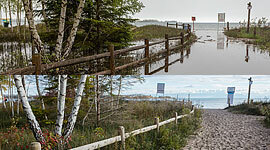 Cibola underwater, during and after the Flood of 2017, by the turnoff to St. Andrew’s By The Lake. Click image to view larger. 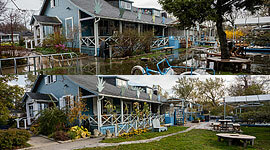 Bayview Ave underwater during the Flood of 2017 and again in 2018. Click image to view larger. 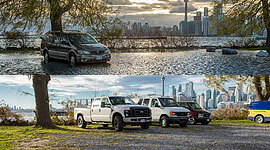 The parking lot by the Ward’s dock during and after the Flood of 2017. Click image to view larger. 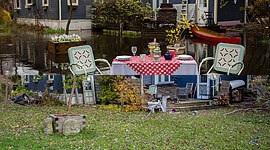 Ken’s Table for Two during and after the Flood of 2017. Click image to view larger. 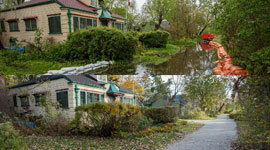 The WIA clubhouse during and after the Flood of 2017. Click image to view larger. 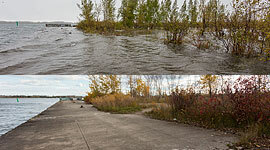 The approach to Ward’s beach, underwater during the Flood of 2017 and again in 2018. Click image to view larger. 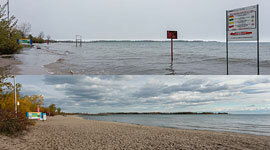 Ward’s beach during the Flood of 2017 and again in 2018. Click image to view larger. 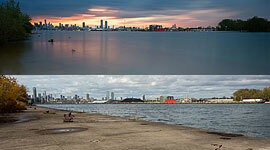 The southern end of the eastern gap, looking north towards the City, in 2017 and 2018. Click image to view larger. The south end of the eastern gap, in 2017 and 2018. Click image to view larger. 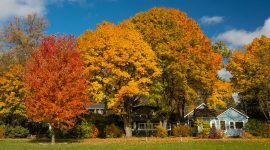 Fall colours light up Fifth St on a gorgeous November day. 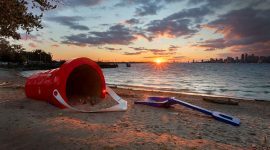 Nature’s Sandbox, a Rogue Wave 2018 installation by Thelia Sanders-Shelton.